Janus [JAY-nus] is the sixth satellite of Saturn. It was discovered by Audouin Dollfus in 1966 and was named after the god of gates and doorways. It is depicted with two faces looking in opposite directions. Janus has an irregular shape with a size of 196x192x150 kilometers (122x119x93 miles) in diameter. 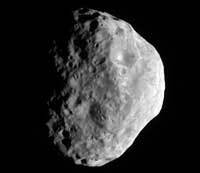 It is heavily cratered with several craters 30 kilometers (19 miles) in diameter. The pervasive cratering indicates that its surface must be several billion years old. Prometheus appears to have fewer craters indicating a younger surface while Pandora appears to have an older surface. Janus has few linear features. Janus and Epimetheus share the same orbit of 151,472 kilometers (94,125 miles) from Saturn's center or 91,000 kilometers (56,547 miles) above the cloud tops. They are only separated by about 50 kilometers (31 miles). As these two satellites approach each other they exchange a little momentum and trade orbits; the inner satellite becomes the outer and the outer moves to the inner position. This exchange happens about once every four years. 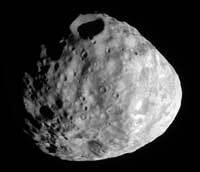 Janus and Epimetheus may have formed from a disruption of a single parent to form co-orbital satellites. If this is the case, the disruption must have happened early in the history of the satellite system. Janus - The Rotating Moon of Saturn. This shadowy scene is one of the Cassini spacecraft's closest views of Saturn's moon Janus. The slopes of some craters here display hints of the darker material better seen on Epimetheus in PIA09813. A bright linear feature runs up the wall of the large crater at bottom center. The view looks toward southern latitudes on Janus (179 kilometers, or 111 miles across). North is toward the top of the image and rotated 58 degrees to the right. From just beneath the ringplane, Cassini stares at Janus (181 kilometers, or 113 miles across). The Cassini spacecraft eyes a prominent crater on the moon Janus. The south pole lies on the terminator at the bottom left of the image. This view is centered on terrain at 16 degrees south latitude, 64 degrees west longitude. This view looks toward the leading hemisphere of Janus (179 kilometers, or 111 miles across). North on Janus is up and rotated 31 degrees to the right. This close-up look at Saturn's moon Janus reveals spots on the moon's surface which may be dark material exposed by impacts. 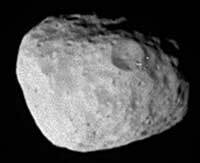 If the dark markings within bright terrain are indeed impact features, then Janus' surface represents a contrast with that of Saturn's moon Phoebe, where impacts have uncovered bright material beneath a darker overlying layer. Janus is 181 kilometers (113 miles) across. Saturn's moons Janus and Prometheus look close enough to touch in this stunningly detailed view. From just beneath the ringplane, Cassini stares at Janus (181 kilometers, or 113 miles across - on top) on the near side of the rings and Prometheus (102 kilometers, or 63 miles across - on bottom) on the far side. 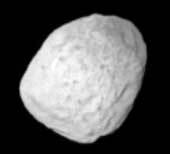 The image shows that Prometheus is more elongated than Janus. Stooke, P. J. and Lumsdon, M. P., "The Topography of Janus," Earth, Moon and Planets, 62 (1993), 223-237. Views of the Solar System Copyright © 1997-2009 by Calvin J. Hamilton. All rights reserved. Privacy Statement.